Gustave Flaubert (1821–1880) is widely regarded as one of the world’s greatest novelists, whose work continues to influence and inspire writers, artists and musicians to this day. Determined from a young age to become a writer, Flaubert found sudden fame in 1857 when his first published novel, Madame Bovary, resulted in an unsuccessful prosecution for obscenity. 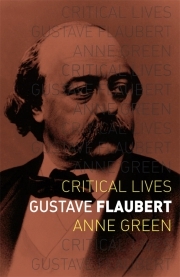 In his subsequent work, Flaubert continued to reflect on the human condition and on the rapidly changing society of his time, while constantly striving for new forms of literary and stylistic perfection. Drawing on Flaubert’s voluminous correspondence and unpublished manuscript material, Anne Green reveals the extent to which his writing was haunted by traumatic early experiences. She weaves discussion of Flaubert’s work into an intimate account of his life and volatile character, as she follows him from his upbringing in a Rouen hospital, through his days in Paris as a reluctant student, his extensive travels in North Africa and the Middle East and his experiences of the 1848 revolution and of the imperial court of Napoleon III. This concise and informative biography is required reading for lovers of literature everywhere. Anne Green is Emeritus Professor of French at King’s College London, and was President of the Society of Dix-Neuviémistes from 2011–17. Her previous books include Flaubert and the Historical Novel: Salammbô Reassessed (2010).